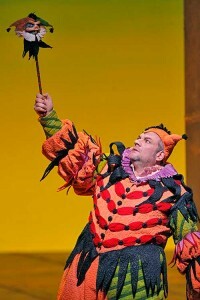 San Francisco Opera’s 90th season opened Friday with Rigoletto. From top to bottom, the cast is formidable. Under the baton of Music Director Nicola Luisotti, the orchestra sounded as vital as ever, though not perfectly clean. The chorus sang with strength. The six current and former Adler Fellows in the smaller roles all sounded perfectly good. Daniel Montenegro (Borsa), Joo Won Kang (Marullo), and Ryan Kuster (Count Ceprano) all move well and look dashing. Laura Krumm, cast as Countess Ceprano and A Page, was equally suited to both roles. Likewise, Renée Rapier looked and sounded appropriate for Giovanna. Kendall Gladen is a sultry Maddalena, and contributed to the splendid Act III quartet. Bass Robert Pomakov is a convincing Monterone, and sounded distinct from the other male principals. Andrea Silvestrelli‘s deep, resonant voice is ever impressive, and his Sparafucile is intimidating. The weakest link of the cast is tenor Francesco Demuro (Duke of Mantua). His is a whiny, bright sound. He sounds a little hysterical at times and seemed more girlish than the Gilda. That said, he did not embarrass himself either, his volume is fine and his voice has a certain reed-like prettiness. His “La donna è mobile” was decent. It was rather strange that the audience did not respond to this aria, and did not applaud. Aleksandra Kurzak has a throaty, dark soprano and certainly looks appropriate for Gilda. Her intonation is precise, and she never sounds shrill. Her voice sounds anchored and certain, but vocally she does not seem like an ingénue. Željko Lučić seems secure in the title role. He has a hefty voice, warm and rich. He sang the more tender passages of the piece with ease and grace. He could have been a bit more mocking in the first scene, but his sorrow in the last scene was palpable. This is the third revival of the 1997 production designed by Michael Yeargan. The set, which references Giorgio de Chirico, is neat, moves quietly, and can be changed in fairly short order. The colors used are loud. Harry Silverstein‘s direction is straightforward, but the production feels somewhat bloodless and inoffensive.